Filed to: Go FoMoCo Go!Filed to: Go FoMoCo Go! Looks like BMW isn't the only new twin-turbo sheriff in town. Back during the Detroit Show we hipped you to the knowledge that FoMoCo was readying a "twin-force" V6 good for over 400 hp that would be showing up in a Lincoln flagship. Not good enough for Mulally, apparently. 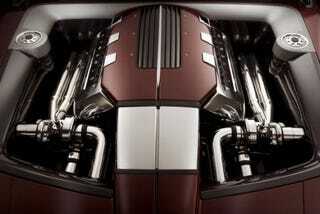 Turns out that Dearborn is actually preparing twin-turbo 4 and 8-cylinder engines as well. Which is fantastic news. For their part, Ford is saying that this new family of forced induction mills will be easy on our pocketbooks, explaining that "twin-force will offer diesel-like fuel economy." And that's good, we like that. But they are leaving out the part about how twin-turbo V8 Mustangs (and maybe the Interceptor...) will be better than 10 Super Bowls. Direct injection and cylinder deactivation will also be part of the mix, natch.